Ms. Yellen has said headwinds are holding back the economy. Right! The Fed is working full-time to that end. 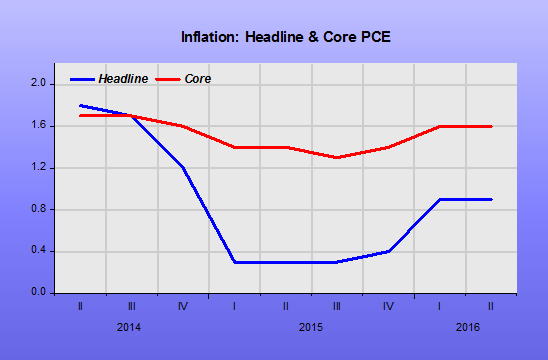 And, if they continue their quixotic search for the “neutral rate”; if they continue to believe inflation will climb to target sometime in an unknown future date; if they continue to believe the labor market is “strong”; they will be surprised to see the fed funds rate remaining unchanged for “years to come”! From the BLS today: 38K Payroll and 4.7% unemployment! Will the Parrots at the FOMC continue to think the labor market is “overstretched”? Or will they revise their views to contemplate that their monetary policy is totally inadequate? They could learn something from a historical comparison. 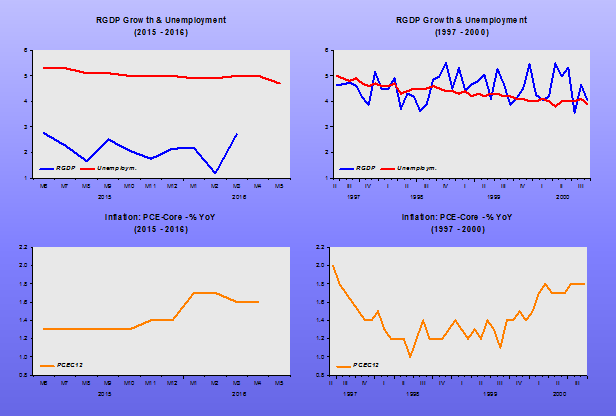 In the “good days”, this same low rate of unemployment went hand in hand with about the same low rate of inflation. 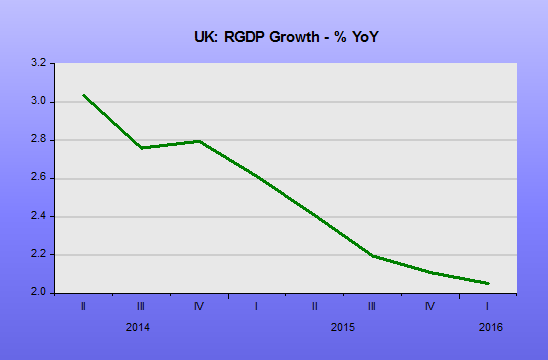 However, the growth rate of real output was in a very different league! Update: And the Fed knows why! The Bank of England has cut its growth forecasts and signalled that interest rates may rise earlier than expected. Higher savings levels as families grapple with their debts and weaker productivity than the Bank was projecting three months ago weighed on the outlook for the economy, also hitting jobs. However, the Bank said inflation would overshoot its 2 per cent target within two years, putting an early interest rate rise on the table. The MPC must be “MWI” (that´s “meeting while intoxicated”) because the story told by the following pictures is a very sad one! 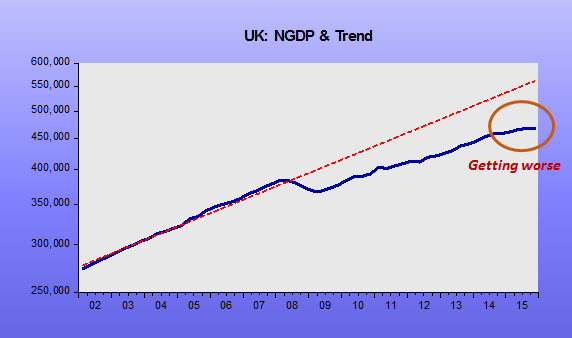 After more than 15 years of great nominal stability (only more recent period shown), the BoE, like the majority of central banks, thought that nominal spending (NGDP) had to be “jerked down”. For the past two years it has been trying to “jerk-it-down” even more. And what about inflation? After a spell at zero it is just positive, but the “farsighted jerks” think that in two years’ time it will likely be “2.1%” and so “we have to act shortly”! Australians must urgently confront the danger that the Reserve Bank of Australia is nearing the very limits of its powers and risks stumbling into the same zero-interest rate trap that has neutered European and Japanese central banks, say two high-profile economists. Saul Eslake, one of the nation’s most experienced economists, and the ANZ Bank’s top analyst, Richard Yetsenga, say the examples of major central banks around the world don’t provide much hope that ever-more intensive monetary policy stimulus can resurrect inflation. “The evidence is that even aggressive monetary policy action doesn’t seem to be driving up inflation, so far,” Mr Yetsenga told AFR Weekend. Calls for a national debate on the eve of the Federal election about how the central bank operates come after the Reserve Bank issued the weakest inflation outlook since introducing its 2-3 per cent target range in the early 1990s. It also comes a day after Phillip Lowe was announced as the replacement for RBA Governor Glenn Stevens. 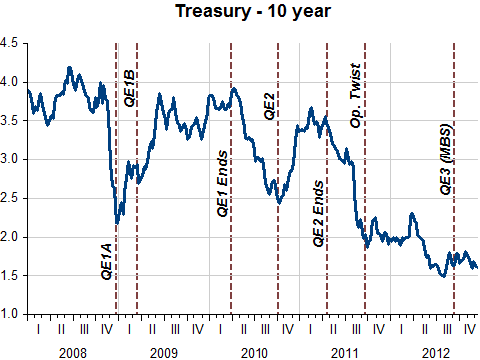 “Aggressive monetary policy action”? Quite the opposite. Australia weathered the international crisis of 2008-09 because, differently from most other central banks, it managed to avoid letting NGDP to fall below trend, quickly reversing the initial fall in spending, as the two charts indicate. By identifying the stance of monetary policy with the level of its policy rate, it has allowed NGDP growth to fall continuously, and that has taken the level of spending below the long-term trend. 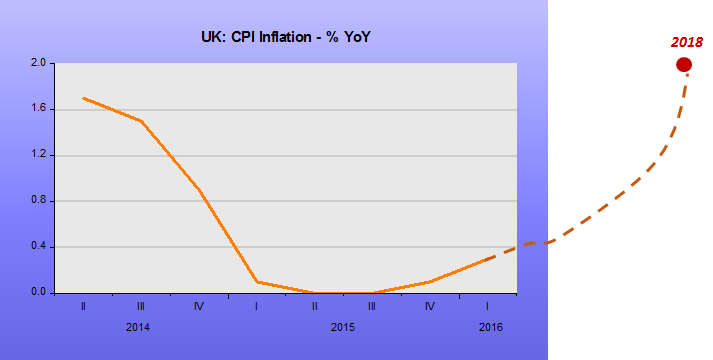 Meanwhile, inflation has fallen somewhat below the 2%-3% target range, something that is not novel. 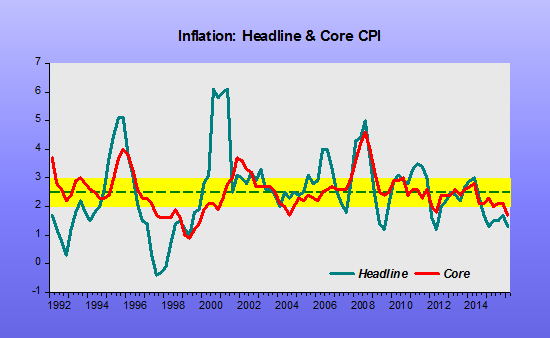 Since the start of the “IT” regime in 1992 Australia´s inflation, both headline and core measures of the CPI, have averaged 2.5%, and that´s certainly a most satisfactory outcome. 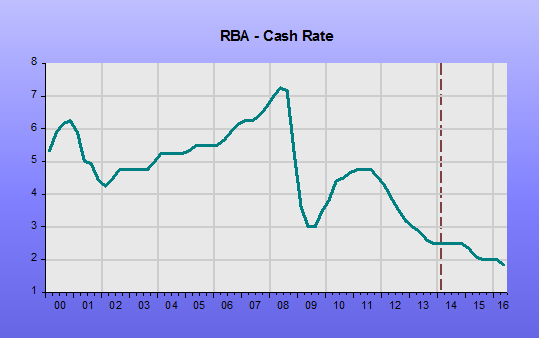 The RBA´s goal should be clear. Work to put NGDP back on the level trend it was at! We have already outlined why inflation targeting is voodoo economics. The juxtaposition of two articles in Saturday’s FT (which I pay for in hard copy, but are behind a paywall) neatly illustrate why targeting NGDP expectations is so important. Debt is nominal but you need nominal growth to pay it back. Especially if you have a smaller nominal economy than expected you will have problems with that debt – and much else besides. Paul Johnson, director of the Institute for Fiscal Studies, says the bad news on nominal GDP is much more serious for the public finances than the small headline reductions in real growth forecasts. 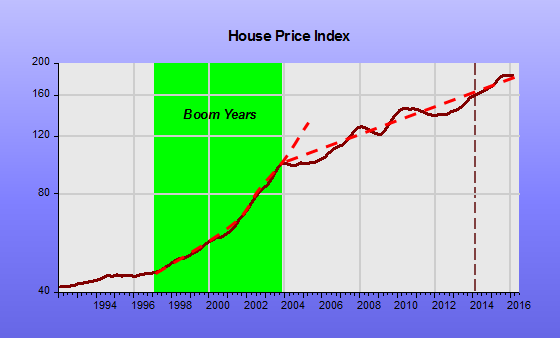 “The cash coming into the exchequer will be lower, and . . . freezing benefits and increasing pay by just 1 per cent turn out to be less of a real [spending] cut than intended,” Mr Johnson says. With £18bn knocked off the level of nominal GDP, standard calculations would suggest that if the chancellor kept policy unchanged, this would feed through to a cut in tax revenues of about £9bn every year, enough to wipe out the projected surplus in 2019-20. 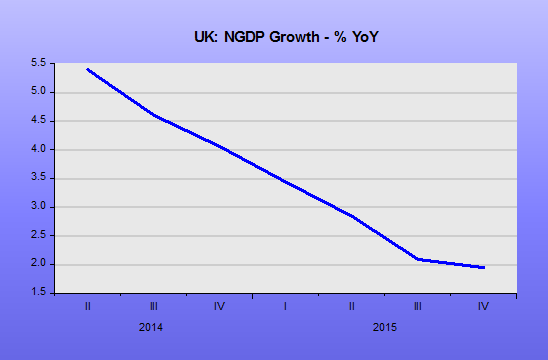 The last Labour government learnt how quickly public finances can deteriorate when nominal GDP undershoots. Julian McCrae, deputy director of the Institute for Government, recalls that when he was in the prime minister’s strategy unit in 2008, “we kept nominal [public] spending the same, but that meant huge increases in real terms”. The second article reported a new and important study that showed why targeting either inflation as the Bank of England says it targets, or real GDP as it actually does, is so dangerous. They also illustrate that while the Output Gap is a valid concept it is unmeasurable, so targeting it is a form of voodoo economics, just like inflation-targeting. 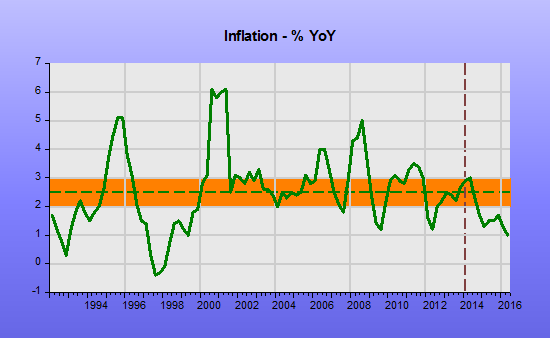 Essentially, because inflation is not measurable, real (inflation-adjusted) output is not measurable either. And thus the output gap between actual real output and “theoretically optimal” real output is just pie in the sky too. All we have is total nominal output (or income or expenditure). Real measures of output (income or expenditure) are just not good enough quality given the challenges of correctly calculating an inflation index with which to deflate actual, nominal, figures to the supposedly underlying real, ones. Support for this view, as reported by the FT, has come from the recently released exhaustive review into UK economic statistics conducted by Charles Bean. The review makes many excellent points. Some opponents of NGDP Targeting, and even some sympathisers, dislike the idea because of the supposedly more often revised NGDP figures. We have dealt with those very weak, lacking-knowledge, criticisms already. Bean goes through some of the obvious points about the lack of hedonic adjustments in the price indices. Even in the US hedonics is not that widely used. And as I have explained, without a transparent, specific, index for quality adjustments the inflation index itself does not really make sense. 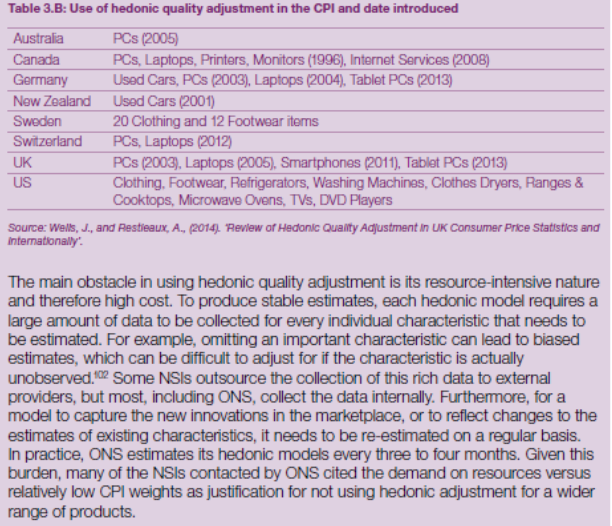 A choice section is where the high cost of making hedonic adjustments is cited by the UK’s Office of National Statistics (ONS) as a reason for not doing them. So we just have to live with highly unsatisfactory data instead. Or rather we have to live with the awful consequences of a wrong-headed pursuit of wrong numbers by central banks, ie inflation-targeting. The section on the lack of any quality adjustments to services is equally damning. Quality change is not unique to physical goods. Non-tangible characteristics, such as service reliability, effectiveness, or customer satisfaction can vary over time, which means that the quality will not be constant. However, quantifying movements in quality without clearly defined characteristics can nevertheless prove conceptually much more difficult when compared to physical goods. To be fair, an additional area of challenge to GDP measurement as whole, not just to the deflators comes from intra-firm transactions by multi-nationals, usually with an eye to minimising tax burdens, but other issues can drive these too such as regulatory arbitrage by banks. This section explored two potential rationales for inter-subsidiary transfers, redomiciling and intellectual property transactions. But these issues are not exhaustive and the challenges from intra-MNE transfers are more diverse. Transfer pricing can also be used to distort non-intellectual property transfers and debt can be shifted around the arms of a company creating distortions through interest rate payments. Continued integration of global markets is expected to perpetuate the trend to greater foreign asset ownership – of both foreign ownership of UK assets and UK ownership of foreign assets. Therefore intra-MNE transactions of the sort discussed above may increase, worsening potential statistical measurement problems. These issues make the Ireland and Luxemburg GDP number particularly hard to compile and, frankly, to believe. It is no wonder that these two developed countries are always the last to be accepted by EuroStat into the Euro Area GDP calculations, if at all. The genuine challenges of measuring actual or nominal GDP should be recognised. 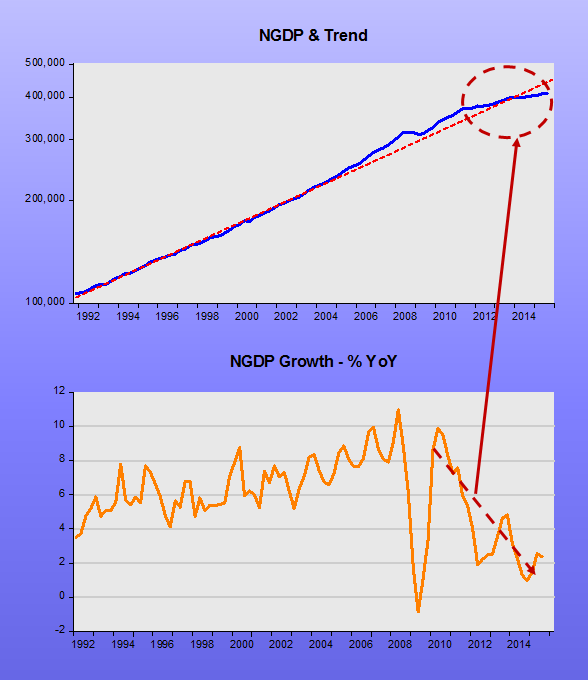 Market Monetarists believe nominal stable growth in NGDP is all important to prevent downturns becoming dangerous, unemployment-creating recessions, due to the sticky wages problem. 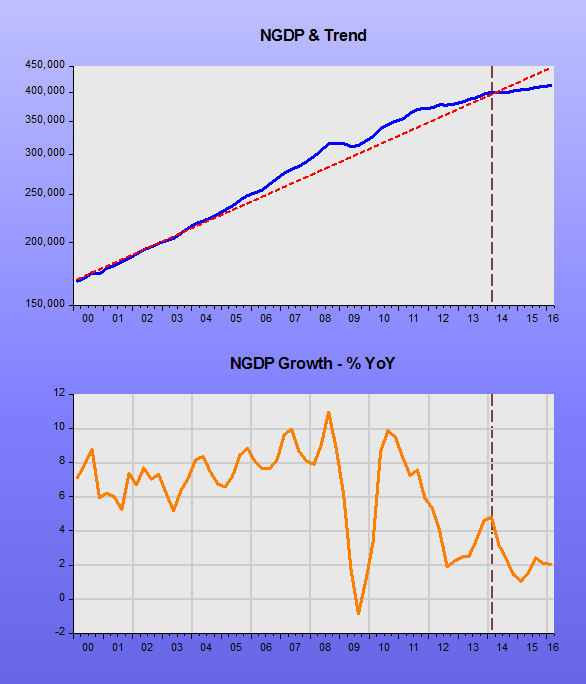 Targeting nominal growth expectations, and keeping those stable is thus far superior to targeting actual NGDP growth. This is partly because it is inevitably backward-looking, but also due to these genuine issues on measurement. If mistakes are made in NGDP looking back, it won’t matter, bygones are bygones. And it must be so much worse to target things as hard to grasp and calculate as either Real GDP or its ugly sister, inflation. This is to say nothing of which inflation measure to target – either its very overestimated form the CPI (HICP in Europe) or its merely overestimated form the GDP Deflator as in the US. And then on top of all this pile of uncertainty is added a theoretical amount of real output that economists claim they think should be produced. OK, I understand the concept. But what to make of pursuing the difference between a theoretically amount of optimal real output and the essentially unmeasurable amount of real output? The pursuit of the output gap or, more colloquially, “slack”. The dolls used in voodoo are real dolls, but they have no actual physical link with the people they are supposed to represent. Sticking pins in the dolls will not harm the individual. Unfortunately, pursuing unmeasurable concepts like “slack” or “inflation” could well harm people. In some sense, targeting the output gap or inflation is worse than voodoo. Medical doctors first have to take the Socratic Oath: do no harm. If only inflation hawks and slack-hunters took the same vow. It is, of course, absolutely right that the gap or slack should be minimised but how anyone can have any confidence in the number is beyond belief. Hundreds, perhaps thousands or PhD theses and articles have been written on such an impossible to actually quantify number. What a waste of effort! Just target nominal growth expectations and avoid sticky-wages caused unemployment and recession. Then leave it to the non-monetary experts, the politicians and the public to argue about what is really going on, ex-inflation and how to make things better if necessary. But please don’t get distracted from the main task of providing nominal stability.